Good morning ladies, and happy Monday!! 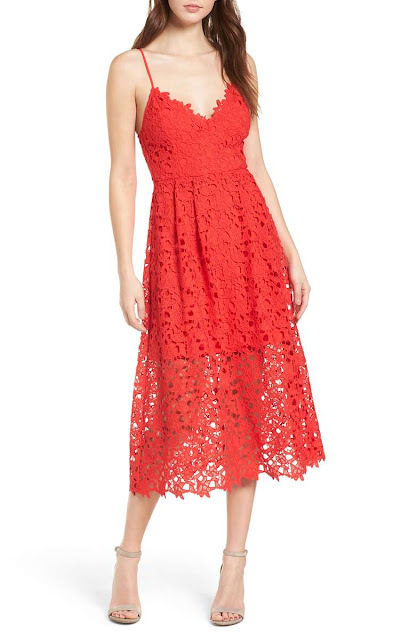 I am so excited to share this gem of a dress that I recently found online at Nordstrom. It is perfect for almost any and every occasion. And with the beautiful navy color, it can be worn all year long. The cut, the fit, and the gorgeous lace details make this dress such a showstopper and make it look much more expensive than it actually is. So yes, if you've been looking for the perfect dress that can we worn repeatedly, then I highly recommend adding this one to your closet asap! And you guys already know how much I wear these Stecy sandals during the spring and the summer...they go with every dress I own. They are under $80 and are surprisingly comfortable with such a tall heel. To show you a few more of my favorite affordable dresses for spring and summer, check out the ones below! I'm dying that they added this lace number that I already own in white and black and also in a stunning shade of red. Hi Isela! Yes ma'am it does run tts. For reference I am wearing the xs.